THERE'S THIS STORY. And it's a story all Jake fans must learn (and which a lot of you probably already know) and a story all Jake fans must form an opinion on. 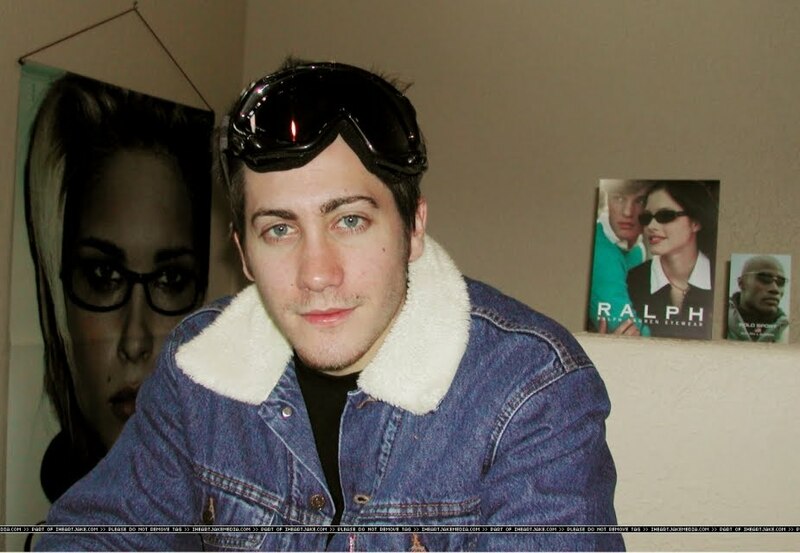 When Jake Gyllenhaal was younger, had shorter hair, and was living in the desert because he was filming Jarhead, he was completely obsessed with the song "Candy Shop" by 50 Cent and played it nonstop and drove Peter Sarsgaard nuts. When Prophecy Girl was younger, had shorter hair, and was living in Ireland because she did that one time, she developed an ill-advised crush on a male roommate who was completely obsessed with the song "Candy Shop" by 50 Cent and played it nonstop and drove Prophecy Girl nuts. So she will always associate this song with heavy drinking and Tesco frozen pizza and the carefree days before the roommate in question unceremoniously dumped her for yet another roommate. All thoughts, opinions, or wistful reminiscences regarding the song "Candy Shop" by 50 Cent are welcome and wholesomely encouraged. 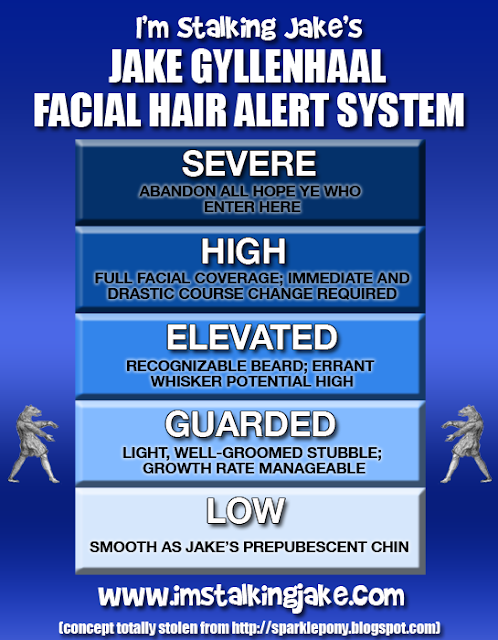 Or, if you would like to just watch a Brokeback parody of Jarhead on YouTube, you can do that, too. 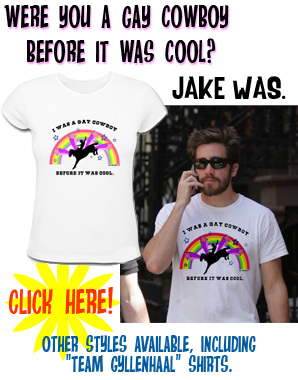 Thanks to gyllenhaalisgr8 for the well-timed Jarhead find! once upon a time....i loved this song....oh wait,I STILL DO!!! Paula! What part of Ireland are you from?? Oh wow, I am not surprised Jake loved Candy Shop, I would think it would so fit with his character in JH. I am not a big fan of rap, except for Em, (really love his latest with Rihanna), & I do like some others, I actually liked Tupac back in the day. 50 is OK too, & Kanye when he does a feature like in Hurricane from 30 Seconds to Mars. PG, I love how your Candy Shop experience paralleled Jake's so perfectly. That has to be a sign, I think. So... im out agents for the next week. Im flying off to Hong Kong in a couple of hours for some "work conference" AKA... SHOPPING! I LOVE IRELAND. *O* I've never been but I always fantasize about going there. Have you heard of the Sister Fidelma mysteries? LOVE that series. Ever read Gracelin O'Malley? It slays me. And this song really has no relevence to me because when it came about I was young(er). I didn't listen to the radio back then. I was too obsessed with making my slow way through all of Green Day's albums. Vanessa - Now its YOU who is stealing me heart. I adore Eminem. I have all his CDs. "I Love the Way You Lie" is brilliant, I agree. I loved his old records as well. They were so provokative yet comical and clever. He's a King. Tupac is dope as well. (I love Rap) Kanye's best song ever is Homecoming, imho. Wow, KD, that is cool about you making your way thru Green Day, I adore that band & have all their CD's. & I totally know what you mean about Em's old stuff, I just love Slim Shady, that was the coolest ever. >;-) But Love the Way You Lie just does me in. That was brilliant with Rihanna's hook. Have you seen the official vid yet? I loved it, but then I am an old fan of Dominic Monaghan & he is always good, plus Em & Rihanna look great in this one, even Megan Fox was good in it. Interesting how Jake fans like similar things, huh? Oh my, PG, I am so envious of your Ireland experience, that is a country that I will visit some day. It is in my blood & I do want to track down my ancestors. All I know is that my great grandfather McGill married a Native American in Louisiana & here I am, all mixed up with all kinds of heritage. Didn't you just adore the countryside over there not to mention the great people & the pubs! (I have seen a ton of pics, videos & books on Ireland) Oh yeah, the pubs! I try to frequent Irish pubs here as often as I can handle it, but I'm sure they are not even close to the real thing. Gotta love my Irish punk music too, Dropkick Murphys & Flogging Molly. Love any kind of Celtic rock or folk music though. Hey have you ever blogged about your time in Ireland with pics & stuff? If so, I would love to check it out sometime. Well, all I can say to that is "D'Oh!" How could I have thought you would write all those experiences in just a blog??? Of course you would have way more than that written down & a book would be INCREDIBLE with your writing talents. All right, woman, it appears I am going to be buying not one, but 3 or more books in the future... Yay, can't wait for you to be published FINALLY! Vanessa + PG - I am a die hard Green Day fan. I have all their albums as well. (Next to Em's!) Of course Jake fans have exceptional taste in music! 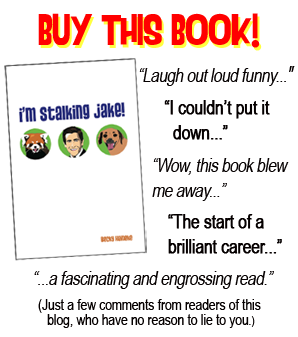 Just look at JAKE'S exceptional taste! It was bound to be. Vanessa - I have seen the official video. I thought it was great. Megan Fox and Dominic Monaghan did it for me though. Such violence, passion, and regret! Ahh, to be young and...in love? LOL. PG - part of Gracelin O'Malley takes place in Cork. I can't wait to read your books on Ireland. I absolutely adore the country and have read so many books about it. I am so envious that you got to experience the land's beauty first hand! I made a vow to myself that I would visit the country before I die. SORDID AMIRITE? Oh, I would hope you would have some embellishments to make the book more fun, so good for you! & I am not surprised at your once again great knowledge of the Fab Four! Ireland along with the rest of the UK is next up on my list of all the places I plan to travel to. I have only been to Italy so far & that was amazing. Since the UK is in my blood, I really believe that will hit home with me more, & will visit Abbey Road studios when I hit London for sure. Ireland is also the home of several of my favorite actors, Colin Farrel, Cillian Murphy, Jonathan Rhys Meyers, Michael Fassbender, Stuart Townsend, Ciaran Hinds, Liam Neeson, Gabriel Byrne, Stephen Rea, & last but not least, Pierce Brosnan. See, Ireland really truly is a pretty great place! Whoo-hoo! Vanessa - What part of Italy have you visited? I've only been to Rome, Florence, and Venice, mostly doing historical traveling. I tried to hope to Milan but the timing just didn't work out. :\ You're a whole bunch of stuff aren't you? I love Native American culture. My bloodline is partly unknown because my grandfather on my dad's side was adopted and left us before my dad's younger bro. was born. We think we have mixed blood though, as you can imagine a Chinese girl with green eyes being a bit strange. LOL. Oh KD, I had a most magnificent tour of a lot of it starting with Rome & traveling up thru Tuscany to the West coast to the Northern part & back around to the East & central part, & then back to Rome. I got to visit Pisa, Milan, Florence, Turin, Stresa (by Lake Maggiore), Genoa, Padua, Bologna, Venice, Verona, Perugia, Assisi, & there are more that I can't think of now, I went there in September 2004. I need to dig out my journals & pics of my trip & refresh my memory. It was a fantastic trip though, for sure. I hope to go back some day, I still want to visit Pompeii, Capri, & Sicily as well as go back to Rome. As far as my heritage goes, mine's the typical American melting pot for you. I have always called myself a Heinz 57 Variety! ;P I actually have quite a bit of different bloods in me besides Irish & NA. I also have Scottish, English, Swedish, & a little French, too! THAT SOUNDS RIDICULOUS. I would have loved to have visited all those places! That's what I get for trying to cram 2 different countries in 2 weeks. We should dig up our pics and share! IT'd be awesome to share and compare! Heyy, that rhymes! LOL. I don't have many pictures of my eyes. It'd be funny if I did. I can probably find one or two, maybe. I'll have to look later. It's gotten me quite a bit of notice. People either a) believe I'm mixed or b) think I'm wearing SUPER DUPER contact lenses or something. Neither which are correct. Hahaha.